The Grand National Trial race is an important trial for the ever popular Grand National race, which is the biggest steeplechase race of the year. It is held on April 6th this year and this Grand National Trial will serve as an entrance race for many of the horses participating. The Grand National Trial is open to horses five years or older and it is run at Haydock Park. The distance of the race is 3 miles and 4 furlongs (1 mile shorter than the Grand National) and there are 22 fences that must be jumped by the horses. Although Betfred is the sponsor of this race I much prefer betting at Bet365.com, and that is where I’ve found the following odds. There are the odds for all of the horses in this race that currently have shorter than +2000 odds. Like all National Hunt chase races the field is much larger than the horses listed and if you want to see the odds of the entire field you should visit Bet365.com. Bet365 is also offering each-way betting on this race with you receiving 1/4 of the odds listed if the horse finishes in the first, second, third or fourth positions. Katenko and Teaforthree are the early favourites to win the trial. Katenko has won his last two races (Johns Spirit and Fruity O’Rooney), while Teaforthree finished 2nd at the Coral Welsh National in his only race of the year. It was Monbeg Dude who is listed at +700 odds who won the Coral Welsh National earlier this year, so he is another one to watch. 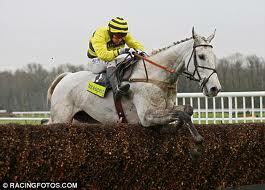 As mentioned above Bet365.com is our recommended bookie for betting on the 2013 Betfred Grand National Trial race. If you visit Bet365.com and click on ‘Horse Racing’ in the left sidebar you can scroll down to the “Antepost” betting section to find the race. Click on Betfred Grand National Trial to see the odds for all of the horses expected to participate in the race. The Grand National Trial has been run since 1968 (with 3 omissions – 1986, 1987 and 2002). It was originally a 3 mile race, but was extended to 3 miles and 4 furlongs in 1991, which comes closer to the length the horses will have to run at the Grand National in April. To learn more about the race check out the Wiki page.